Summer is a busy time for all of us and the school holidays are finally in full swing, so it’s difficult to find any spare time to get things done around the house. There are plenty of home-made cleaning tips and tricks that prove to be highly successful in the short-term but what makes Apple Clean stand out from the rest is the high-tech cleaning techniques we take advantage of. We realise that our clients are almost certainly going to need as much time as possible over the summer, so we make sure the work is done in a quick and straightforward manner. We make sure our services are carried out in the background so that you can get on with your usually day without any hassle. All in all, this means we’ll have your home sparkling in no time at all and thanks to a completely discreet service. There are some cleaning jobs that just seem too demanding in many cases and for many different reasons but Apple Clean have experience cleaning all kinds of domestic and commercial properties. The tough stain you’ve struggled to cope with can be dealt with using our high-tech cleaning equipment and there’s no job our skilled team haven’t dealt with before. You can certainly count on us to get your home interior back in the best possible condition. To find out more about our cleaning services this summer, call us today on 0800 587 4571 and our friendly team will help organise an appointment at your home. I think perhaps the most important benefit of using Scotchgard stain protection, at least for this particular customer, is that it gives you some important peace of mind – you’re not worrying about stains all the time! In addition, it makes carpets and fabrics easier to clean as well as making vacuuming more effective. Have Scotchgard professionally applied to your carpets and furniture and you know that whatever mess your little ones, whether two- or four-legged, create, you won’t have a lasting memento (it helps prevent the discolouration of light coloured fabrics and carpets, too). With the application of Scotchgard to your carpets and upholstery, you’ll either be able to sort out the stain yourself or you’ll know that when it’s time to call on Apple Clean for professional carpet cleaning, the evidence of that red wine spill, the dirt trampled in from the garden or the pizza stuffed down the back of the sofa can be treated more effectively. Scotchgard helps protect the investment you’ve made in your carpets and upholstery. So, using Scotchgard is as much about preventing stains as it is about removing them. You’re staying a step ahead of those sticky fingers, dirty paws and unwieldy elbows! Scotchgard is invisible and you don’t need to worry about it affecting the colour of your sofa, carpet or rugs. We know a thing or two about carpet cleaning at Apple Clean and over the (many!) years, we’ve learnt that stain protection doesn’t come any better than Scotchgard. It has been a top brand for over 50 years and we’ve yet to find another product that comes close. That’s why I recommended it to this Chichester customer, why I’m mentioning it here and why I will suggest it the next time someone asks about the best way to protect their carpets and furniture. For more information on Apple Clean carpet cleaning services, contact the team on 0800 587 4571. 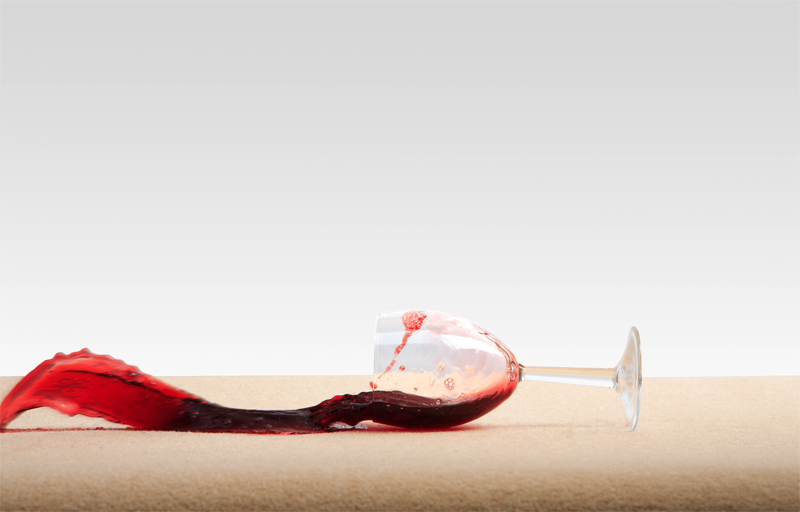 I promised you carpet cleaning myth busters on the Apple Clean blog and I thought we’d start with perhaps the most feared stain of them all – red wine. What is the myth about cleaning red wine stains? Well, there are actually two: dumping lots of table salt on them and pouring lots of white wine on them (you are better off drinking it). These two remedies will get you absolutely nowhere, apart from into the kitchen to find more carpet or materials. Here’s what you should do. Carpets and upholstery are made up of lots of different fibres which will absorb red wine in their own unique way, so it is very important that you blot the liquid with kitchen towel as soon as possible. Whatever you do, don’t scrub or rub – you’ll just spread the stain. Just blot. Don’t be afraid to use the whole roll if you need to – the quicker you soak up the spill, the weaker the potential stain you’ll have to deal with. Of course, the colour of your carpet or upholstery will also determine the appearance of any stain. Avoiding red wine stains on your carpet or upholstery is not just about following the correct post-spill cleaning instructions. Spills are much less likely to become stains if your carpet or upholstery has been treated with Scotchgard. It’s best to get expert advice on this from a professional carpet and upholstery cleaning company. If, despite your best efforts, you can’t rid of your red wine stain, don’t panic. It will come out and your carpet or upholstery will look beautiful again. All you have to do is call your local professional cleaners. For more information on our carpet, upholstery and curtain cleaning services, including red wine stain removal, contact the Apple Clean team on 0800 587 4571.